Normally, I get about 4 or 5 emails a week from teachers who have purchased my word problem resources for Kindergarten, 1st grade, and 2nd grade. Most of the questions that I get, are related to students having difficulty understanding what to do when they encounter addition and subtraction situations. Like I have said many times before, I am not a math oriented person. As a matter of fact, I was one of those students who hated it due to math anxiety. 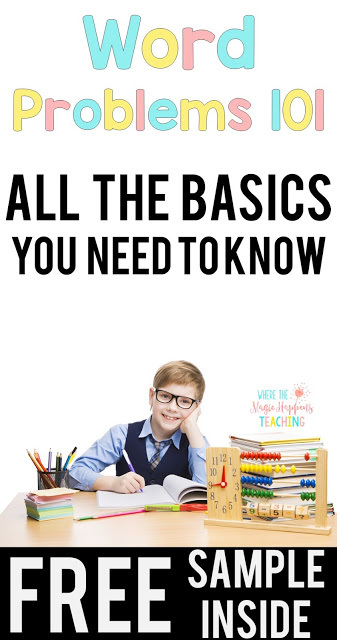 I, however, have done my “homework” in terms of not letting my students (and my own boys) get to that point and today I want to offer you some insight. Modeling–> Direct modeling must be your step #1 in helping your students understand and develop a sense of context and relationships when learning how to solve word problems. 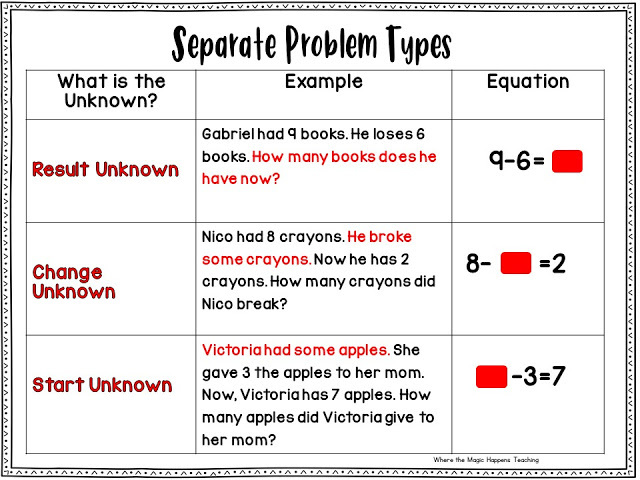 I wrote about helping students discover the relationships in story problems HERE. You cannot expect your students to use and apply any strategy without modeling it first. Let the kids use their fingers if they are in K or 1st, or even if they have not had enough exposure to addition and subtraction situations. They will need LOTS of opportunities to interact, listen, fail, and succeed. Some modeling strategies are: using fingers, drawings, or using actual objects. Counting strategies–> Students who use counting strategies to solve story problems, probably don’t need to model every number. When you see that your students are using counting strategies, they are probably more aware of the relationships in the story problem. Some of their counting strategies can be invented and some others you will have to model as part of your pacing guide. 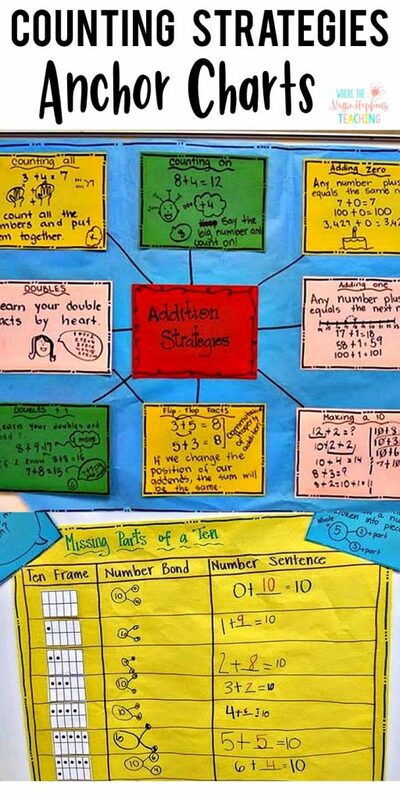 These are some anchor charts with counting strategies (addition and subtraction ones) that I have made in the past with my students. Derived facts–>OK so this is the stage in which your students truly demonstrate their knowledge and fluency of number facts. Usually, I can tell when my students are composing and decomposing numbers, compensating, looking for ways to use benchmark numbers. etc. I wrote about benchmark numbers HERE. On the other hand, at this stage, students are already computing. And with computing comes to urge to solve. At times, this urge to solve and compute, may take our students away from making sense and analyzing the story problem. When you start observing this, you can try removing the numbers from the word problems. That way, they have no choice but to make sense of the context and relationships. There are just about 14 or 15 word problem types. There are some that are more difficult than others, but by the end of 2nd grade when the children have been exposed to all the types, they should be fluent with these addition and subtraction situations. 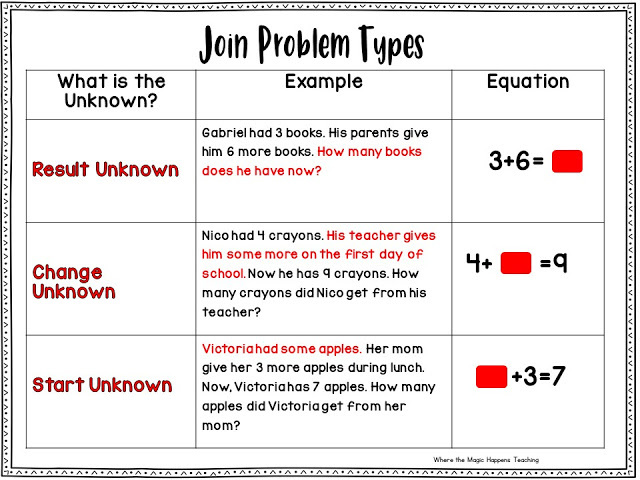 In my opinion, “join” and “separate” word problems should be introduced first. 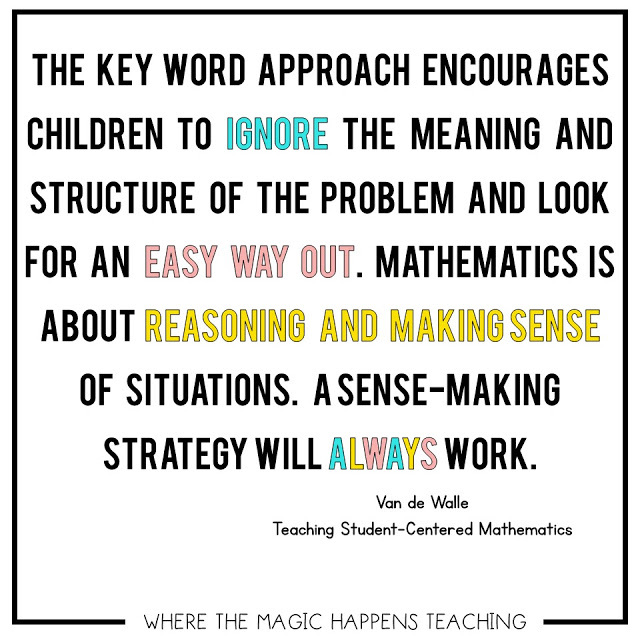 They are easier to solve because they involve actual actions that children can model or act out. These two word problem types are perfect to introduce and solidify the concept of part-part-whole using number bonds. From experience I tell you: Unknown start and unknown change problems will always be a bit more challenging than the others. This is because when my students are getting ready to model the problem, they do not know how to start… because the start is unknown! Part-Part-whole word problems are so much fun. I used to teach them when I taught first grade a couple of years ago, and we usually used them as an opportunity to develop conceptual understandings and to make combinations of. They are also perfect to use with Rekenreks! This is especially true for English Language Learners and for students with poor number sense skills, and/or very little language experiences. 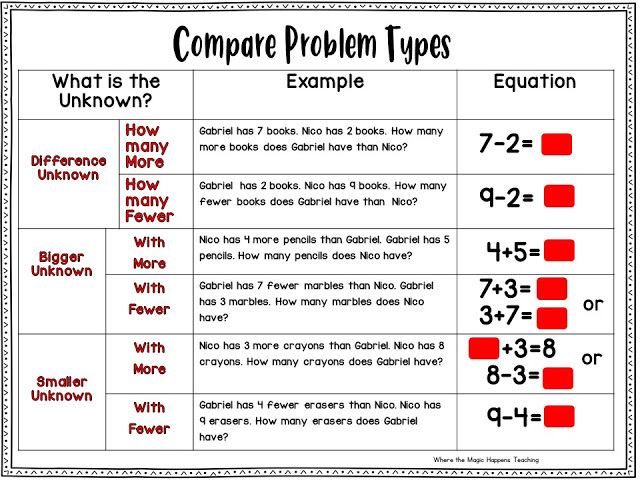 Compare type of word problems provide the perfect context for you to introduce and teach strategies using bar models. I will be blogging about this later. 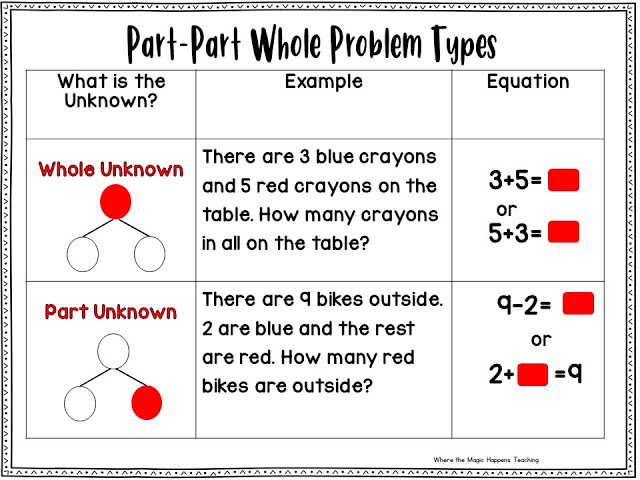 You may download these problem types cheat-sheets HERE! Please do me a favor and do not teach your students to solve word problems using keywords. Either you are a younger teacher or a seasoned one, avoid telling your students that “in all” means add, or that “left” means subtraction. I can see how, when we are close to testing season, we may resort to this, especially if we have students that still struggle. But for goodness sake, this takes away from the real conceptual understanding and we are only patching things up in a lousy way. 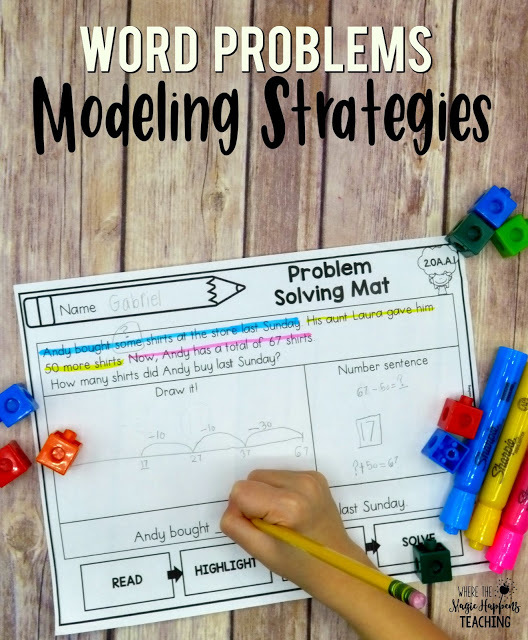 Keywords are misleading… the truth of the matter is, not many story problems have keywords and your students will not be able to solve multi-step word problems either. 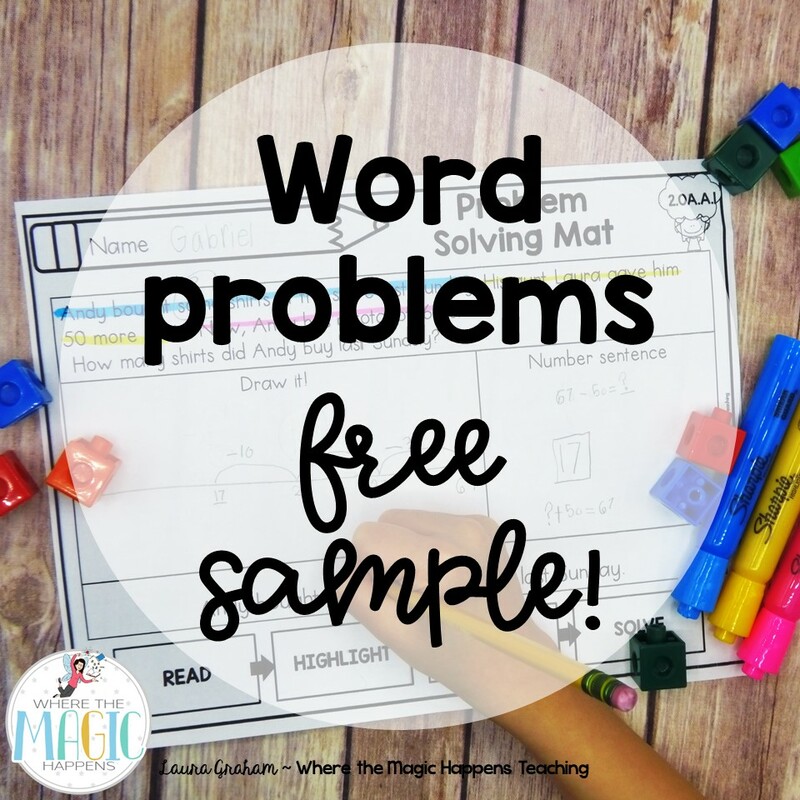 You may get a FREE sample of my word problems for first and second grade HERE! You may also get the FULL products from my TPT store. I hope that you enjoyed this post, thanks for reading!